Did Jesus have a death wish? And soon afterwards, Jesus ‘set his face to go to Jerusalem’ (9:51). So Jesus’ exasperation expresses that of Yahweh. He longs to be free from the crookedness of his generation. We can go further. By echoing the words of Yahweh in the Torah, Jesus implies that Israel is basically unchanged. The generation that angered Yahweh at the Exodus and that which troubled Jesus are essentially one and the same. Israel’s God has been enduring them ever since. Notice too what set off this complaint: a father brings his ‘only son’, tormented by demons which one could cast out. The sight of this boy under the power of demons reminds Jesus of Israel’s problem: God’s only son had put herself under the same power, ever since the times described in Deuteronomy. She had never been able to get free of them. This boy, a son of Israel, functions for Jesus as the part that symbolises the whole. To understand, then, what Jesus has in mind for his own future, we must look at Yahweh’s plans for Israel in Deuteronomy 32: after judgement and exile, he will finally have compassion, heal and vindicate his people, and cleanse their land from demons (32:43). So as Jesus turns his face to Jerusalem, we should understand his intentions the same way: not to absent himself from the mess through death, but rather to get relief from Israel’s misery by healing the nation from demonic powers. Jesus looks ahead to the cross, not as an escape, but with the intention of taking Israel through judgement and into new and transformed life – in himself. 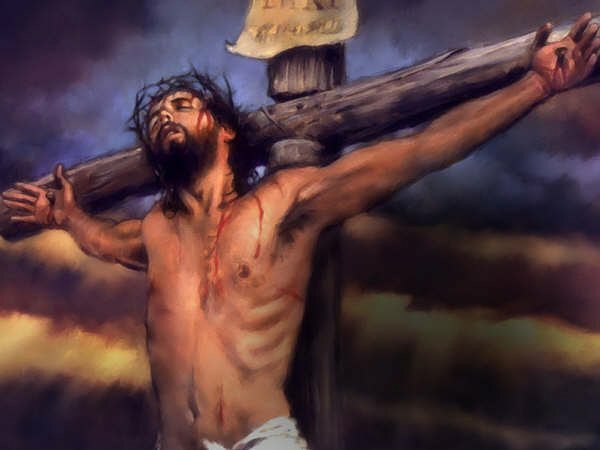 He goes not to die, but to die and rise again on the third day (Luke 9:22). He is not hoping to go somewhere better (the emphasis of so much of the later Christian tradition), but to inaugurate a better generation, here on earth. Christopher Hitchens was a good guy, as far as I’m concerned. I liked him, and now he’s gone I miss him. He was an ’emperor’s new clothes’ type – willing to speak out and stir people up. He cared about things. We need guys like that, badly. Let’s consider this allegation. Normally, thoughts of suicide are frowned upon. A death wish is considered a sign of mental disorder. Except when it’s connected to religion. In which case it may be a mark of faith. In fact, many religions push in this direction, even reserving a special place of honour for those who desire death. This is especially true of Christianity. Through the ages of the church, the desire to die and go away from earth to live in a heavenly ‘afterlife’, has been considered a sign of advanced spirituality. Also Christians have tended to look forward to the destruction of the created order – a kind of cosmic death wish. Hitchens captures the thrust of this succintly: ‘Let this be gone!’ The only thing that needs correcting is his description of the death-wish as ‘secret’. For in Christianity, it has at various times been overt, and even boastful. Buchanan’s main target is commercialism and materialism, but he goes further than that, doesn’t he. And gentle death at last for Heav’n awake me. When Roberts says ‘sorrow’, he means ‘life in this world’. That’s clear, because the antidote to sorrow is ‘gentle death’. American Christians in our day, in particular, seem to be preoccupied with visions of millenial destruction. But of course it’s much more wide-spread than that. 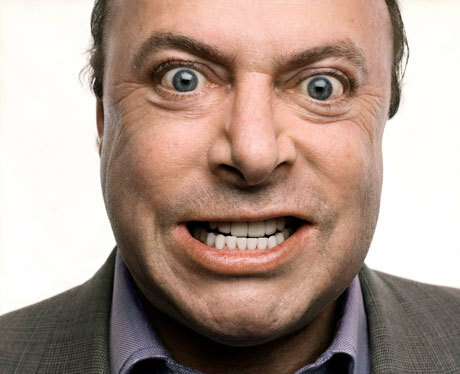 Hitchens has diagnosed the disease with painful clarity: while the rest of the world is worrying about its troubles and sufferings, and wondering how it can be healed, we Christians look ahead with a smile – the smile of the madman who knows he won’t have to worry for long because he’s already planned his suicide. Death – cosmic death – will solve all problems, indeed renders them largely irrelevant. Is this an ‘immoral and sinister thing about religion’? We agree with Hitchens that it is. Let’s come out and say it: there is a prominent strand in Christian teaching through the ages which has pushed the faithful, and indeed the whole Western world, towards mental disorder, by packaging the blessings of Christian faith together with the poison of a death wish. The main way to minimise this disease has been for people to not take their faith too seriously. This has operated at the individual level, but also on a large scale. The West, in a bid to save its society from insanity and death, pushed Christian faith as far to the periphery as it could. We call this the Enlightenment. Tomorrow: did Jesus have a death wish? 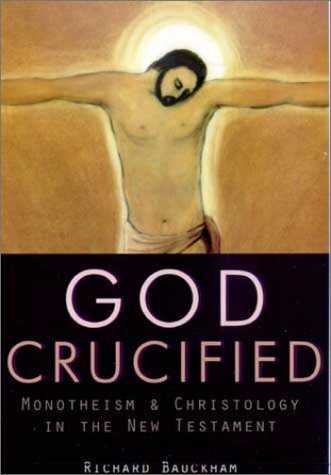 Bauckham argues that a high Christology did not develop gradually in early Christianity – rather the highest possible Christology was there from the beginning, since it is found in all the NT writings. I’ll try to write a review soon, but a few initial impressions. 1. It’s too short! The thing is only 59 pages. I sat down to read this evening and I’m already past half way. I’m going to be sorry when it runs out. 2. This book is a thing of beauty. Written with crystal clarity, drawing on a wide acquaintance with primary and scholarly literature, Bauckham makes his points with force and yet at the same time, with elegance. It’s a pleasure to read. Compared to, say, O’Donovan or Gunton or Dunn, Bauckham’s in a different literary league. 3. So far it is very, very persuasive. I’m looking forward to the rest, and then hope to press on to the essays attached. The volume they’re in is called Jesus and the God of Israel, publ. Eerdmans. I’m glad I’ve finally taken the plunge – the water is fine! Let’s take a minute to get our heads around the message of Daniel. Having made the basic connection with Daniel through the appearance of Gabriel, Luke strengthens it by referencing phrases and words from the ‘Gabriel’ scenes of Daniel 8-10. Gabriel had appeared to Daniel ‘at the hour of evening sacrifice’ (Daniel 9:21) – a unique phrase in Scripture. Now he appears to Zechariah ‘at the hour of offering’. The angel tells Zechariah not to be afraid, using the same words he had spoken to Daniel (Daniel 10:12). Gabriel announces to Zechariah that his prayer has been heard, echoing a parallel announcement to Daniel. For ‘heard’, Luke uses a word extremely rare in the NT, in a form only found in the parallel phrase in Daniel (eisekoústhe Daniel 10:12). 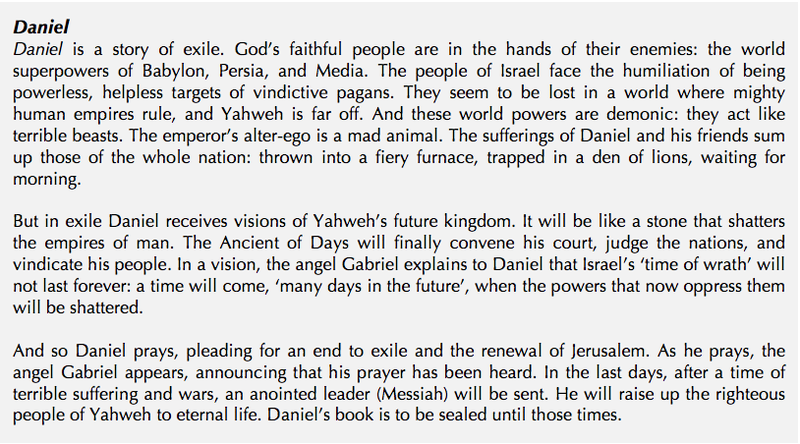 In Daniel’s prayer scene (ch.9) the word ‘prayer’ occurs seven times: the densest occurance anywhere in Scripture. Luke imitates this with repeated mentions of prayer (2 times) and incense burning (a symbol of prayer – 4 times). What is the significance of linking this temple scene to Daniel 8-10, and above all what is the meaning of the reappearance of the angel Gabriel here, after six hundred years? Why haven’t we taken on board Paul’s approach of being men-pleasers for the sake of Gospel mission? Why do we so often contrast pleasing our neighbour with pleasing God, instead of contrasting it with pleasing ourselves? What does it say about us that in our evangelical tradition ‘man-pleaser’ sounds like a label of condemnation? Hard questions. Here are some suggestions towards an answer. 1. Learning to please others instead of ourselves is hard work. It means putting to death our selfishness. It’s easier to use talk about pleasing God to duck our responsibility to please our neighbour. It’s easier to imagine we’re pleasing God when we aren’t really, than to imagine we’re pleasing our neighbour when we aren’t – neighbours are more likely to let us know! So staying focussed on pleasing God is less disruptive to our lifestyle. We can sound godly and never have to ask whether our hearts are loveless or selfish. 2. Our view of holiness involves keeping our distance from our neighbours: holiness = separation. So the idea that living for the glory of God might involve pleasing our (worldly) neighbours probably doesn’t make much sense to us. We are more inclined to think it glorifies God if we keep separate or even experience rejection from the world around us. If we speak a word of judgement and alienate our neighbours, we can definitely feel that we’re being faithful – at least then we’re not being ‘men-pleasers’! 3. In this way we tend to set holiness in conflict with mission. For Paul they pointed in the same direction, but with our separatist view, they often pull in opposite directions. So if we prioritise godliness, we de-centre mission. That sort of holiness is best achieved in a huddle. 4. At bottom, our deafness to Paul’s exhortation suggests a failure to grasp the dynamic, forward-moving, flexible, barrier-breaking nature of the gospel. For Paul, the gospel propelled him into mission. He found himself taking risks he would never have dreamed of, doing things he would have once been disgusted by, connecting with people he once wouldn’t have touched with a barge pole. Paul got mixed up with idol-food, he talked with and stayed with Gentile women, he did dumb ceremonies he didn’t need to do, in an obsolete temple. He transgressed all the laws of Jewish purity that he’d grown up with, for the sake of Gentiles, and he kept them all for the sake of Jews – all because the news about Jesus demanded it. “I do it all for the sake of the gospel…” (1 Cor 9:23). For Paul, if there was a barrier between him and someone, he’d pretty much bust through it. Making positive connections with people, getting involved and commending his faith – these were core gospel priorities. So his gospel pushed him to radically not please himself, but please others. What we call ‘the gospel’ doesn’t seem to have much of that effect on many of us. Perhaps suggests we haven’t quite got it yet? Paul’s gospel, I mean. Maybe we need to keep listening to Paul until we’re convinced about pleasing our neighbour, until it feels important to us. Then we’ll know we’ve likely understood his gospel. And maybe then we’ll start doing the hard work on our own characters, to learn to stop pleasing ourselves so much and think of others. I’m going to give it a try. And once ‘man-pleaser‘ no longer sounds so much like a label of condemnation, maybe then we’ll be on the way to learning how to do mission effectively. Here the contrast is between pleasing our neighbour or pleasing ourself: quite a different issue. The gospel message is not at stake here: it’s about the everyday business of getting on together in the church family (see Rom 14). Rather than being impatient and judgemental with our neighbour’s failings, we should put up with them graciously, and seek his good. We should take the part of others rather than please ourself, for this promotes unity and wellbeing in the church. 1Cor. 10:31 So, whether you eat or drink, or whatever you do, do everything for the glory of God. 32 Give no offense to Jews or to Greeks or to the church of God, just as I try to please everyone in everything I do, not seeking my own advantage, but that of many, so that they may be saved. Be imitators of me, as I am of Christ. Here Paul is in missionary mode. As an ambassador of Jesus Christ he avoids giving unnecessary offence to anyone. If the Jew will be offended by his eating meat sacrificed to idols, then he won’t eat. He has a right to eat, but he seeks their benefit not his own. If the Greek will be offended by his refusing hospitality, then he will eat food sacrificed to idols, and play the willing guest. If unity in the church is threatened by his missionary practices, he will adjust them as far as possible to avoid tensions and troubles. In other words, Paul bends over backwards to ‘please everyone in everything I do’. He has to be as flexible as a gymnast, and change colour like a chameleon. He will put himself in uncomfortable and morally ambiguous situations. He will take risks in order to please people. He will lose opportunities in order to please other people. Paul is not infinitely flexible. There are hills he will die on, but many others he’ll just retreat from instead. His message is not negotiable, but his practice is capable of stretching a long, long way into pagan culture for the sake of people. What’s driving all this? It’s Paul’s missionary calling. He pleases men ‘so that they may be saved.’ Amazingly, another way to describe this kind of pleasing men is ‘doing everything for the glory of God‘ (v.31). So when it’s a choice between pleasing God and pleasing men, don’t be a men-pleaser. But when it’s a choice between pleasing yourself and pleasing men, be a men-pleaser. Tomorrow: why haven’t we listened to Paul’s instruction to be ‘men-pleasers’? I grew up as an evangelical learning that there were two types of person: men-pleasers and God-pleasers. As Christians we were called to please God and not man. Gal. 1:10 Am I now satisfying man or God? Or am I trying to please people? If I were still pleasing people, I would not be a servant of Christ. Eph 6:6 obey your earthly masters…not only while being watched, and in order to please them, but as slaves of Christ, doing the will of God from the heart. 1Thess. 2:4 But as we were approved by God to be entrusted with the gospel, even so we speak; not as pleasing men, but God, who approves our hearts. We would never talk like this in my tradition: pleasing men is BAD. Only pleasing God is good. So I want to ask some questions – that’s what we like to do at The Grit! Starting with, why have we been unreceptive to this strand of Paul’s teaching about pleasing men? But also, how do these two apparently contradictory themes fit together: not pleasing men, and pleasing men?! Maybe I’ll tackle them in reverse order. In Galatians 1 Paul is contending that his message came from Christ direct, and was not of human origin. His gospel ministry is initiated by God, for his purposes – Paul is not preaching to satisfy some human agenda. When it comes to the gospel message, Paul pleases God, not man. In 1 Thess 2, Paul is making a similar point. He brought the gospel message to Thessalonica against strong opposition. And Paul accepted that – he never tried to ingratiate himself with his enemies by flattery. He just spoke in spite of them, because he was there as a servant of God, and so had to fulfil his commission. He had to please his own master, not someone else. When it’s a choice between pleasing God and pleasing man, when the gospel is at stake, Paul thinks you have to please God not man. So far so good. In Ephesians 6 Paul writes to slaves who are facing the temptation to be dishonest in their work, putting on the pretence of hard work when the boss is looking, but really slacking off. Paul says you haven’t only got your master to please – you’ve got Christ also. Think of him as the master you’re working for. Here it’s not a contrast between pleasing man and God – a not….but…. – this time it’s a not only….but also…. Nothing wrong with trying to please your master. Only bad if you try to trick him into being pleased, and forget to please Christ. So when the gospel is not at stake, when you don’t have to choose, pleasing man is not considered a bad thing, it may actually be a good thing, as in this case. Tomorrow we’ll consider the other side of the coin, the ‘please men’ instructions.